This week’s preview is Asami Tanaka, a new master for the Ten Thunders faction. Continuing with the precedent established by Shen Long, she is single faction (apparently the infiltration part of the Thunders’ plans has now passed) and seems to be an interesting mix of traits that makes for a unique, Oni themed crew. But what is she? Other than a walking, talking bad-hair day (rimshot) a speculation has been made, based on that hair and the description provided by Wyrd that she is a support master but doesn’t “lack her own bite.” This led to some speculation as to what sort of horrible thing she may actually be, which was tantalizingly teased by Nathan that the community was on the right track. So let’s go with the assumption that the speculation is right and present the monster Tanaka may actually be: a Futakuchi-onna. 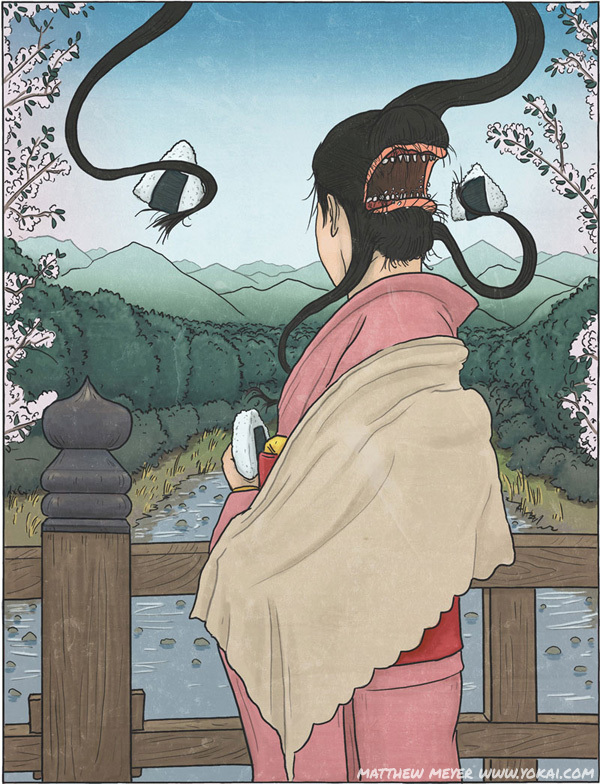 This is a creature from Japanese myth, a woman with a mouth on the back of her head. Created in most myths by a miserly husband who fails to feed his wife, this creature’s hair acts as tentacles that feed the mouth on the back of the head which will end up consuming twice as much as the mouth on the front. Personally, I always love these new Ten Thunders style creatures, mostly because I’m not familiar with Japanese folklore at all, so things like Yin the Penanggalan and the Kamitachi are always a fascinating look into an unfamiliar culture. Also, as a dungeon master for other roleplaying games, they’re always good to crib and use for other things to make my pcs miserable. If Tanaka really is one of these onna monsters, then she is a very cool addition to the faction. But what is she in Malifaux? Let’s see what we can glean from the card. Her stats are pretty strong, in my opinion. She diverges from the Ten Thunders pattern of 6’s all over the place, but with Lillith’s defense stats, 10 wounds, and Hard to Kill she has some decent staying power. The rest of her stats and her cache are fairly middling, but this may not be a huge surprise given that the preview mentions that she can call forth Oni onto the field of battle, which sounds pretty much like she’s a summoner. This fills a gap in the faction and puts her in an odd place, as she has Lillith-y stats but will likely want to be midfield, since she’s summoning and giving her Oni the ability to charge as a (1) action. Rush of magic is always a good thing, especially for summoners which can tend to be card (and suit) intensive. Just for reference, the list of Oni in Malifaux are: Ama No Zako, Obsidian Oni, Jorogumo, Kamaitachi, and Tengu. I’m sure she’ll have other synergies with Oni, but I can only see the first three getting much use out of the Charging buff. Still, I’m sure there will be new Oni coming with her release, and it should make for a very cool and very weird looking crew! All of these masters have been pretty strong, in my opinion, and I don’t know who I’m more excited to see (ok, it’s Titania.) Ripples of Fate is going to be a pretty awesome book, if this trend keeps going. See you next week!